To Order: We accept Credit Cards, Purchase Orders, Invoicing, etc. To order online, go to the Products Tab. However, IF YOU ARE TAX EXEMPT or need to purchase via Purchase Order or Invoicing, please call or text Karen at 806-241-8380 to process your order. If you prefer to place a phone order for any other reason, we accept phone orders. Please call us. Questions about the products? Call or text 806-241-8380. Looking forward to hearing from you! LOWER YOUR COSTS WITH OUR PROVEN AND PATENTED TECHNOLOGY. The Filter Blaster is a MUST HAVE for Agricultural Equipment, Construction Equipment, Trucking, Powder Coating, Landfill Equipment, Mining Equipment and more. If you work in a Dusty or Dirty Environment, GET A FILTER BLASTER! Filters are Expensive! Save MONEY and TIME with a FILTER BLASTER! STOP Throwing Your Money Away! Clean Your Filters with this One Tool in about One Minute! Patented tool to clean dirty air filters. It does a great job, and does not damage the filter. Air Rotor Jacket Tips are directional, so you never get a direct blast of air in the filter. Clean filters fast with the Air Filter Blaster! Work in a dusty or dirty environment? Why do you need a Filter Blaster®? Clean your filters multiple times. What makes the ORIGINAL FILTER BLASTER SO UNIQUE? No Ball Bearings. No Needle Bearings. No Grease. Directional Air Jackets - no spot in the filter ever receives a direct blast of air, plus this helps to clean the filter top to bottom! Fuel Savings of 5 Gallons an Hour. BIG RETURN ON YOUR INVESTMENT! Even if you went up to 200psi, the air jackets never allow any more than 48.2psi to come out of any one air jacket. It spins so fast, you never have a direct blast of air to damage the filter pleats or elements. Rotors available in 3", 4.5", 6" and 9"
Generally 30 to 45 seconds and the filter is clean and ready to go back into your piece of equipment. "Before I had Air Filter Blaster, I would have to replace my filters more often. Since purchasing the Blastser, I have been able to reuse my filters and have saved loads of money!" "I have tried using other filter cleaners in the past, but they either did a horrible job or put holes in my filters. Air Filter Blaster is by far the best product I have ever used for cleaning filters and is the only product I would recommend. "Since I Started using Air Filter Blaster, I have saved my clients money on filter replacements. My clients have also said they have saved on the amount of fuel they use. I have recommended this to everyone I know." "The Filter Blaster is our ULTIMATE WEAPON when it comes to cleaning filters." A REVOLUTIONARY NEW METHOD FOR AIR FILTER CLEANING. AIR FILTER BLASTER® is a new patented method for air filter cleaning that dramatically reduces air filter replacement and fuel usage on motorized equipment. The technology has been proven in extensive field trials. The system requires only a simple source of compressed air. Ports within the AIR FILTER BLASTER'S® centrifugal forced air induction chamber create a shaft rotation that uniformly vibrates and discards dirt and particles from the inside of the air filter outwards. 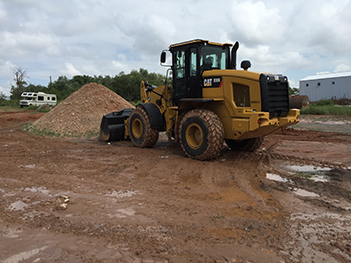 Although the process is simple and direct, cost savings for a single application upon even small sets of equipment may well pay back the acquisition cost in a single application! By reducing fuel usage, filter replacements and landfill charges, AIR FILTER BLASTER® generates significant ongoing cost savings while helping your company achieve green fleet goals. Save money while "going green"
Annual savings of over $10,000 per vehicle can be realized using AIR FILTER BLASTER® technology. 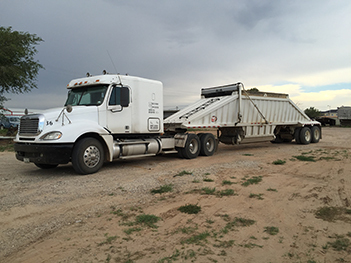 Based on our extensive field trials, here is one example of yearly fuel cost savings for a 725 Rock Truck (articulated 6X6 dump truck). Will it hurt my Filter? No, the distribution of air only allows a maximum of approximately 48 psi to come out of any one air jacket in the FILTER BLASTER®. The filter guy says not to clean my filter! Why is the FILTER BLASTER® different? The Filter manufactures say don't clean your own filters because they know that the average consumer is using 125 to 150 psi directly out of the air compressor. This high of pressure coming out of a single nozzle can and will tear the filter element, therefore allowing dirt particles to go directly into your engine as well as your Turbo charger. ( Dirt particles are also accumulated into the filter by using this method) Also going directly into your intake. The sealing of the filter element is one of the greatest benefits of using the Filter blaster product. It prevents particles from entering the filter element! How many times can I clean my filter out with the FILTER BLASTER®? Salmon River Innovations has tested just about every canister filter on the market and has deliberately clogged them and then cleaned them using the FILTER BLASTER® and out of 100s of filters and cleaning them 60 times we had not one tear or damage to the filter elements. We also try to discourage anyone from using starting fluid(Starting fluid /either deteriorates the filter element causing it to become brittle) The FILTER BLASTER® is the best and most efficient way ever invented to clean your air filters, so as long as you always inspect your filter before re installation you can get as many as twenty times the life out of the same filter. How much fuel can I save by using the FILTER BLASTER®? The bigger the equipment the greater the savings. Some large combines will consume an additional three to five gallons an HOUR more fuel if the air filter is 50 to 75% clogged. In the course of a twelve hour day that comes to 60 gallons of fuel. At $4.00 per gallon that comes to $240.00 out of the farmers pocket for the day. If he had to buy a new filter as well that would bring the cost of the day well over $300 for the day. What air pressure do I need to operate the FILTER BLASTER®? PRICING: Filter Blasters are shipped with flat rate shipping of $15 each USA Only. Click here to download the Filter Blaster Price Sheet. 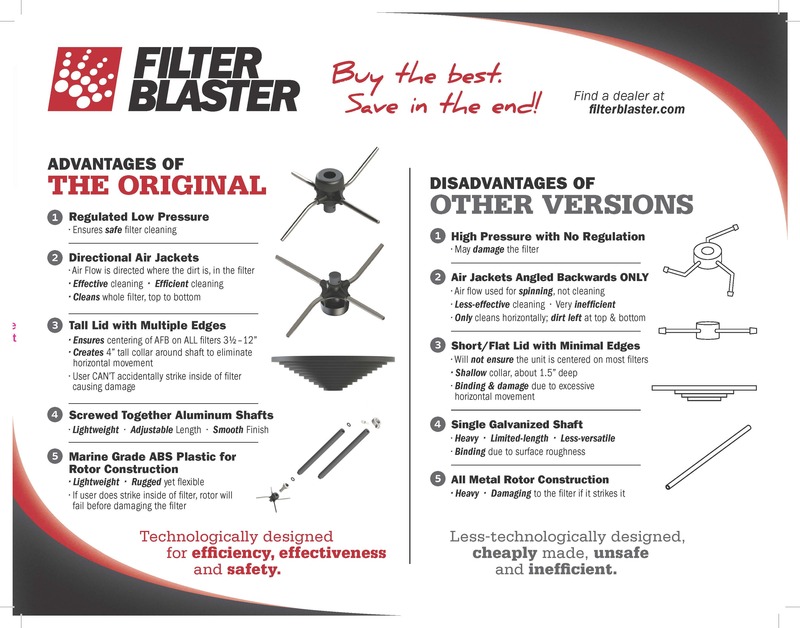 Click here to download the Filter Blaster Brochure. To Order: We accept Credit Cards, Purchase Orders, Invoicing, etc. To order online, go to the Products Tab. NOTE: IF YOU ARE TAX EXEMPT or need to purchase via Purchase Order or Invoicing, please call Karen at 806-241-8380 to process your order. We accept phone orders from anyone wanting to purchase via phone. So, if you don't want to order on-line, please call us. Questions about the products? Call or text 806-241-8380. We'll be happy to help. BUY THE RIGHT PRODUCTS THE FIRST TIME. See how MULTI SEAL® and AIR FILTER BLASTER® will keep you going. Give us a call or send us an email to get more information.